About 18 months ago, a close friend of mine and I were on a jaunt to eat ramen burgers. This was after our recent vacation where I had the opportunity to get ramen in Japanese restaurants in Hawaii, my favorite part of the trip honestly. Afterwards we were sitting in the bar having a beer or two. We were talking about all make an manner of things in our lives. Randomly I blurted out, I'm way into doom metal these days. Now, my buddy is a huge fan of music, but he's hardly metal. We did spend a fun night at Iron Maiden a few years back, but that was an anomaly rather than a staple. So, frankly, he just laughed at my expression of devotion for a certain sub-genre of metal and since then my love of the lighter side of metal, along with the more extreme side, has really grown. The world of music ebbs and flows. Trends come and go. Let's not be totally metal and take the term trend as a bad thing. If it makes you feel, better, we can call them movements rather than trends. Since that conversation with my friend, there have been countless amazing doom metal records. Telekinetic Yeti's Anthony Dryer, like other acts (long) before them has made metal without using, or abusing, the blast beat. In many cases, the blast beat has sapped some creativity from metal drummers relying on the tried and true convention. The fact that this reviewer isn't much of a fan of drummers, the fact that I found myself really focusing on the drum lines, really speaks volumes about the quality here. After a time, it hit me, there aren't any blast beats. It's amazing that's a significant thing in metal in 2017, considering such metal giants like Black Sabbath, Iron Maiden (mostly), Metallica, and more don't really use blast beats. 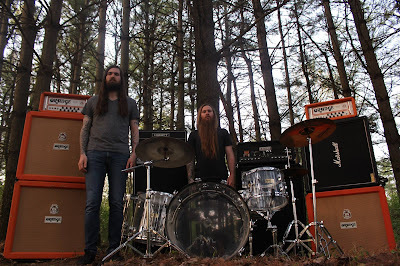 Guitarist/vocalist (and suspected bassist) Alex Baumann brings forth a level of fuzz unbeknownst to humankind. What he does that's a bit unusual is his use of the phaser during standard riffing. As an attempted guitarist, the phaser to me was always a very cool sounding effect, but the idea of using it for more than just on an intro piece, seemed wrong. Thankfully Baumann has shown me just how wrong I was. The riffs twist and turn while his guitar shudders under the weight of his playing. More importantly, Baumann and Dryer seem to be connected at the cerebellum as they are able to make the most logic defying tempo changes. True to Doom Metal form, the music is slow and trance inducing. The vocals have an undercurrent of extreme anger, but it never bubbles over to the top. This album will ensnare anyone who happens to hear its siren call. Sump Pump Records is a labor of love and uses basic packaging. It's not fancy, but that's never been why I listen to records in the first place. The LP itself is sturdy, flat, and sounds amazing. No matter how small, they include a download code with every single release. If you check the purchase link to preorder this beauty, you'll also see that they're not gouging anyone who's interested in the music either. Sorry, but one of my giant pet peeves is the major labels are selling their vinyl releases at prices double their indie competition. 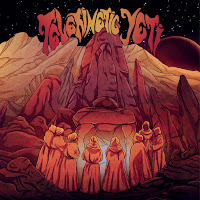 Telekinetic Yeti has created a stellar album that using less is more, except in the guitar effects category and Sump Pump Records has pressed that album onto a great sounding vinyl. Get this in your ears now. If that's not enough....check out their official video. This was the first experience I had with them and it's jaw dropping. Interview: Witchapter Settles It For Me. Stream: Druids "Pulling The Trigger"